Donations (unless anonymous) will be recognized on this page, in our quarterly newsletter, and/or with a NYSAFLT card sent to the person in whose honor the donation was made. See the donation form for complete details. 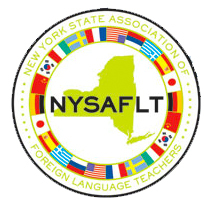 In honor of all the wonderful LOTE teachers I came to know through NYSAFLT. In honor of all the dedicated teachers and the forthcoming generations of language teachers who creatively keep alive the diversity of world languages to the next generations of children. In honor of Bill Anderson. In honor of Al Martino. In honor of Bill Heller, whose encouragement of attending a professional conference while in teacher training lead me to a decade (and counting) of new ideas, new friendships, and professional growth! Thank you Bill! A special thank you to all of those who collectively donated over $1500 in memory of Natalie Carlino.